Although Spring Training is over, it's always great to see different or return to ballparks every year. This year our Florida Travels took us to Kissimmee, Lakeland, Bradenton and Fort Myers. 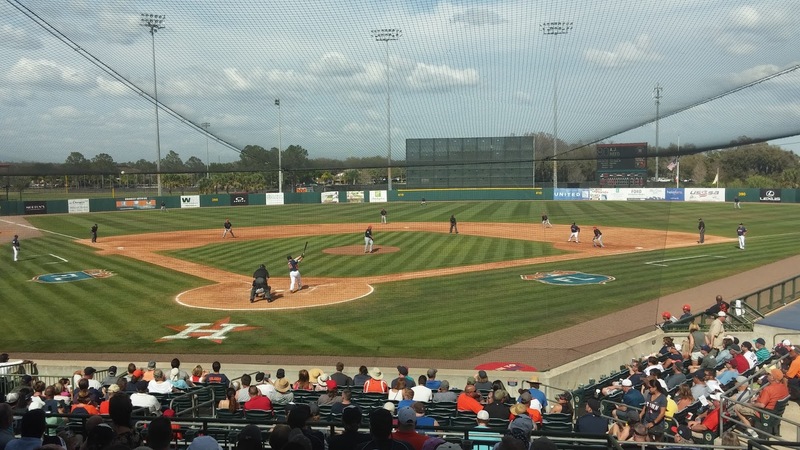 On Friday, March 11, the Detroit Tigers faced the Houston Astros. Last month, I wrote a story on The Memories of Osceola County Stadium so I won't get into much detail in this post. To re-summarize the experience, My first visit to this facility was in 1985 for the Florida State League (FSL) All-Star Weekend. This was the first year this venue was open. The bugs weren't worked out as I had difficulty transmitting the two stories to the Tampa Tribune, thus, I wound up dictating them to My Desk Editor Rick Nelson. Thankfully, that bit of distress became an incredible learning experience for years to come. My return on this day was much easier and there would be no technical problems and the Astros had a newer clubhouse compared to the one they used in 1985. Next year, they're supposed to relocate to a new stadium with the Washington Nationals in West Palm Beach, FL. 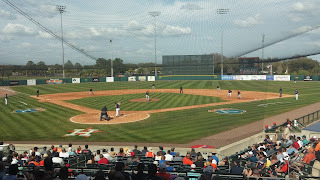 On Saturday, March 12, I enjoyed taking an annual trip to Lakeland to see the Tigers versus their inter-league rivals the Pittsburgh Pirates. I had the opportunity to see old friends like Tom Gage, Ron Myers, who runs the Lakeland Operation for Detroit and oversees the Advanced Class-A Flying Tigers, and interviewed prospect Wynton Bernard. There will be a future story on Bernard in the coming weeks as he continues his quest to make Comerica Park his future home. 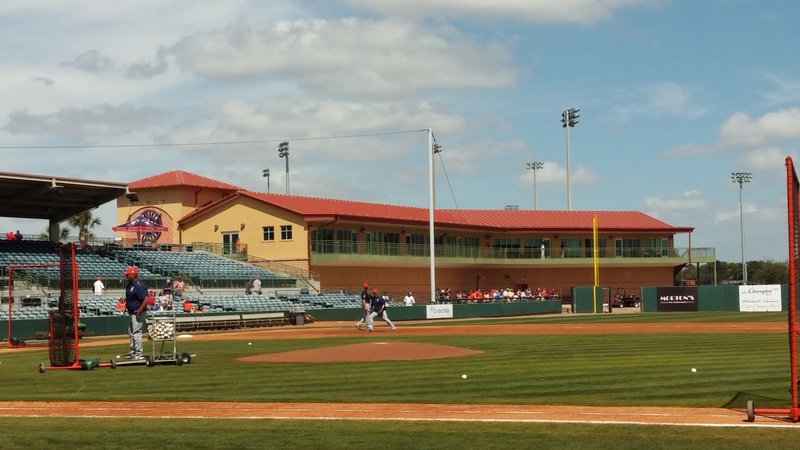 What was interesting about this trip to Joker Marchant Stadium is this was the last time I'd see the venue in its' current state as you can tell by the construction in right field. 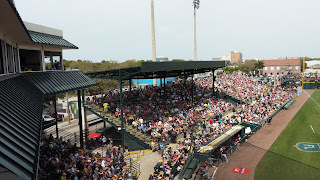 In October 2014, the Lakeland City Commission announced that as part of a new agreement with the Detroit Tigers, a $41 Million Renovation and upgrade of the 50-year-old stadium has started. Funding will be provided in part by the Detroit Tigers, The City of Lakeland and Polk County. The Lakeland Flying Tigers of the FSL are playing at Historic Henley Field, which is located 1 1/2 miles from Marchant Stadium for the 2016 Season. 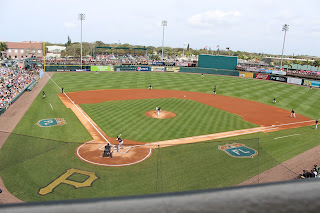 On Sunday, March 13, we went from I-4 West to I-75 South and followed the Tigers to see the Pirates at McKechnie Field in Bradenton. I caught up with Tigers Trainer and long-time Friend Kevin Rand, and spoke with Tigers General Manager Al Avila before the game. I was surprised at the amount of South Florida baseball connections that Avila and I had. McKechnie Field is a very unique facility. When the Pirates play their Regular Season Games at PNC Park, home runs that leave the park wind up landing in the Allegheny River, as boats scoop the balls up. Here in Bradenton, it's a much different situation as foul balls fly outside the park and onto the street with on-coming traffic. I wouldn't dare to take a guess how many foul balls lead to broken windshields or dents which damage automobiles. 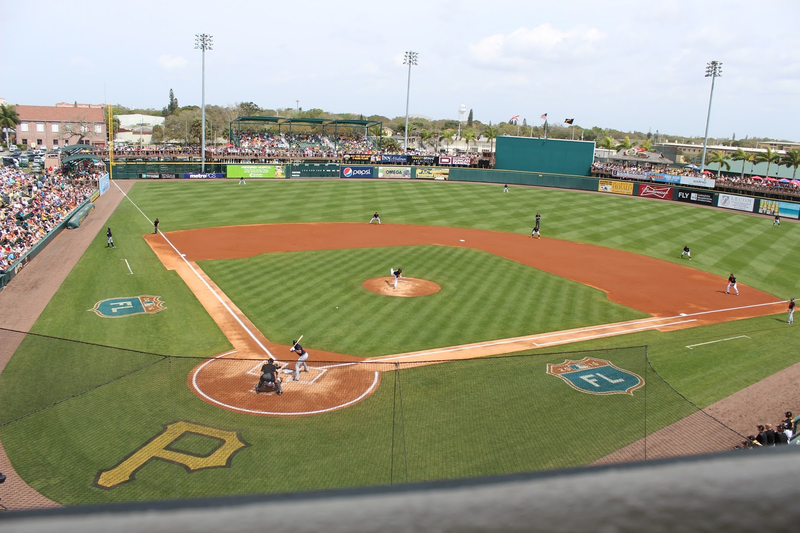 But you can rest assure that those who go to Bradenton are accustomed to this because in addition to Spring Training, the Pirates have an FSL team play during the summer. But overall, this is a nice building that been renovated through the years, and the Pittsburgh Pirates staff treated us great. There were lots of palm trees in the outfield. A few miles down the road, Pittsburgh's Main Headquarters is Pirates City and the entire complex is completely first class. 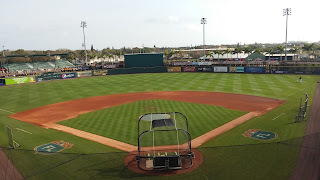 Finally, the Best Spring Training Ballpark I've ever seen to date is in Fort Myers! On Easter Sunday March 27, we took the trip on I-75 North/Alligator Alley, and saw the Boston Red Sox face the Philadelphia Phillies at JetBlue Park at Fenway South. Ground was broken on March 4, 2011 and it opened on March 3, 2012. The capacity is 10,823 and the Field Size is the same as Fenway Park. It's amazing that this venue has a replica of the famed "Green Monster." When I was speaking to the Red Sox PR Department and New England Media, I told them this park should be renamed Jet Jewel Park, because that's how amazing this place is. Due to a non-compete clause with The City of Fort Myers and Minnesota Twins, who play at nearby Hammond Stadium, Boston can't field an FSL team. Instead, the Rookie Short Season Gulf Coast League Red Sox play during the summer months. There were many things which stood out about our experience. First, this was the second to last game for Red Sox Legend David Ortiz in Fort Myers. The slugger is retiring at the end of the 2016 season. Second, I had the opportunity to see an old friend of mind from our days with the Fort Lauderdale Yankees in the early 1980's. I rarely hug athletes, but Red Sox Coach Brian Butterfield was the exception to the rule. In the coming weeks, there will be a Question & Answer Story with Butterfield so stay tuned. 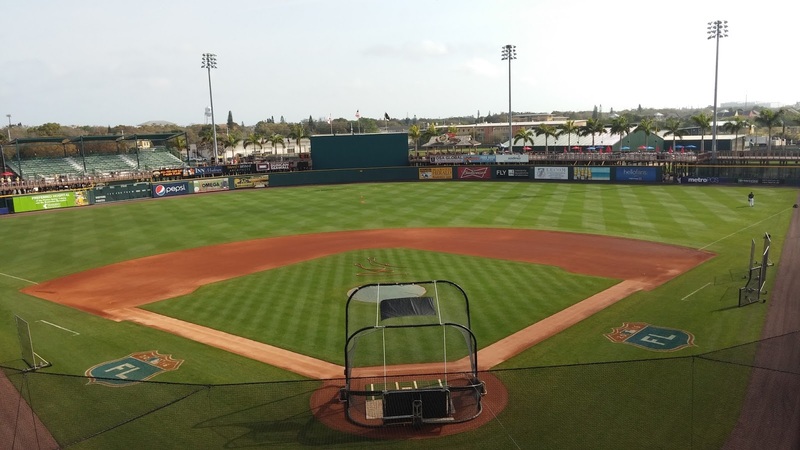 The cost to build JetBlue Park was $77.9 Million, but this is a "Complete Masterpiece." The Detroit Tigers have trained in Lakeland for 80 years which is incredible. If the Red Sox are at JetBlue Park another 80 years, I'll be age 153 buried someplace. Fenway Park in Boston is on My Bucket List before I die, but at least on this Easter Sunday, we both got a taste of it, thus wetting our appetite for a future trip to Massachusetts.